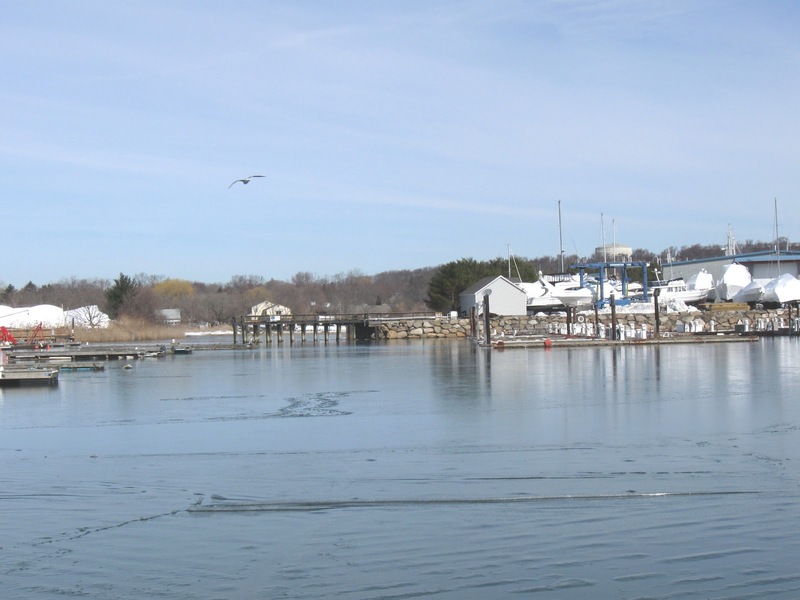 Since working in Danvers, more and more of late, I decided to check out some of the town's local waters and boat launching sites on this cold but sunny morning. Little did I know of the historic role Danversport played in the Massachusetts Bay Colony. It was once part of old Salem Village, and driving along Endicott Street, Waters Street, and Liberty Street I was struck by the look and feel of the place. The Internet provided a wealth of information as to the the area's history. Two sources I found most helpful were the Danversport Harbormaster's Web site and the book "Chronicles of Danvers (old Salem Village) Massachusetts 1632 to 1923" written by Harriet Silvester Tapley. From these two Web sites I found that the Danversport area had been originally occupied by the Naumkeag Indians and was part of a Sachemdom ruled over by Nanepashemet. 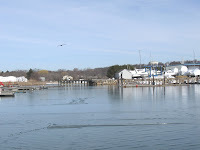 The port is located on two necks of land extending towards the Danvers River and these necks separate three short tidal rivers: Porter River, Crane River, and Waters River. Anyone driving north on Route 128 can see the general area by looking to their right while passing the Liberty Tree Mall. Some may recall the "Danvers Explosion" which ocurred back in November 2006 when a chemical plant blew-up in the middle of the night, destroying approximately 100 homes in Danversport. Back in 1628, nine years after the death of Nanepashemet, John Endecott and his Dorchester Company arrived here from England with a grant of 300 acres on the larger of the two necks. Endecott would later become the first Governor of the Massachusetts Bay Colony. The smaller neck was known as Skelton's Neck. Prior to Endecott's arrival, the Native people referred to the larger neck as Wahquaineschok, said to mean Birchwood, and the smaller Skelton's Neck was called Wahquack, meaning unknown. The Native names for the rivers were Orkhussunt for the Danvers River, Conamabsquenooncant for the Crane River, and Soewamapenessett for the Waters River. The Native name for the Porters River, Pouomeneuhcant, was found in a third source "The Indian Land Titles of Essex County, Massachusetts" by Sidney Perley (1912). It is fortunate that these names were preserved by writers/historians such as Tapley and Perley, and I'd love to know what the names meant to Native Americans. However, I'm afraid it may be too late to ever know this with any degree of certainty. 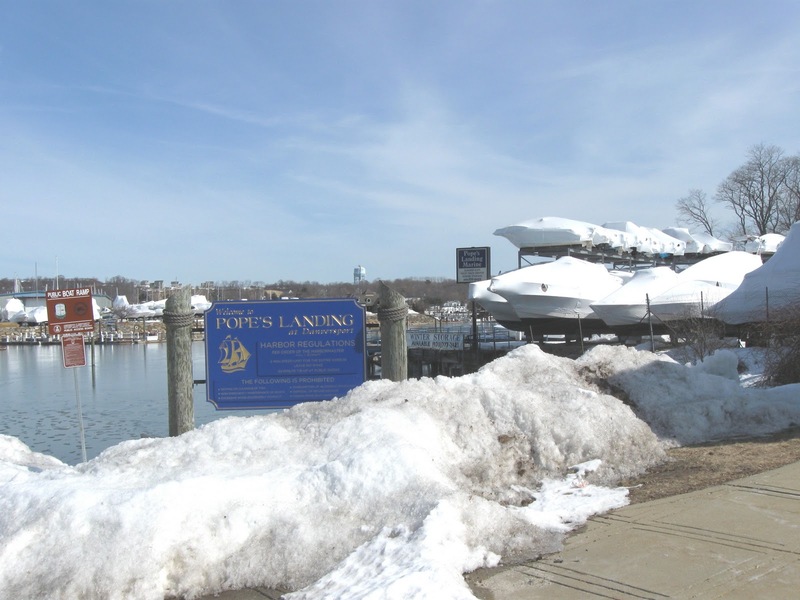 Hard to believe the water's surface was iced over on this fourth day of March. This is salt water and tidal. 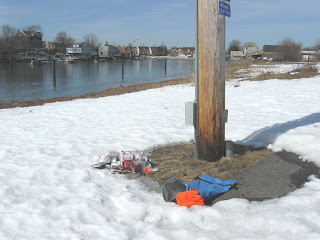 Just another testament to how tough Old Man Winter has been in 2011. It didn't take long to gather up 29 pieces of trash between the two sites; mostly beer cans bringing my YTD trash total to 174. Soon, on a warmer day, I hope to paddle the waters in this area and contemplate what those interesting Native American names may have been alluding to.